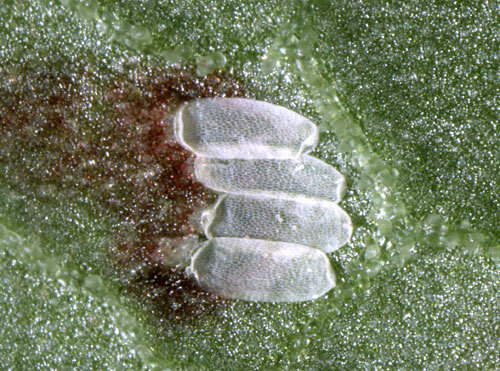 Flies of the family Agromyzidae, sawflies, and some moths deposit their eggs inside the plant tissue, below the epidermis. This requires the possession of an ovipositor. 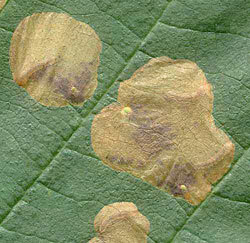 Around tne place of the puncture the leaf tissue may react by swelling and discolouring: an oviposition scar. Some agromyzids deposit their eggs in a row or arc. The eggs (two on tihs picture) end in thin filament. 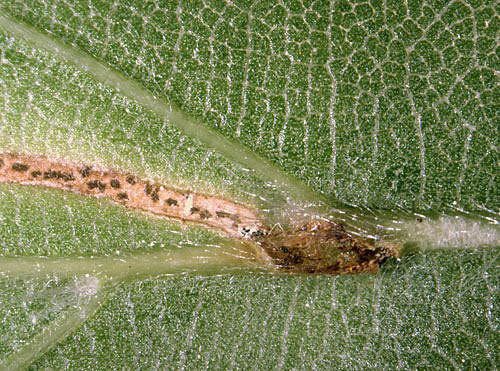 The oviposition scars of sawflies are sometimes recognisable as green pimples, in equal number as that of the larvae in the mine. Weevils don’t have an ovipositor. 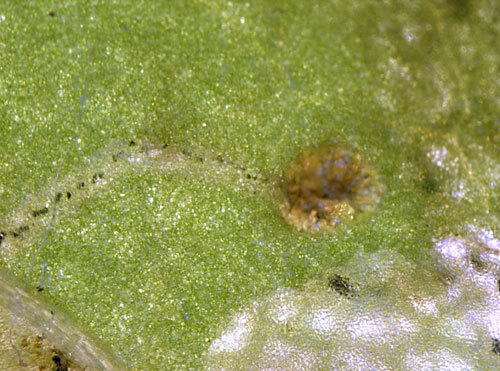 For oviposition the females chew a hole in the leaf, mostly in the liwer side of a thick vein. This results in a large, permanent scar. Females of the fly families Anthomyidae and Scathophagidae glue a small group of elliptic eggs to the lower surface of a leaf. When the eggs are hatched the membraneous shells collapse. 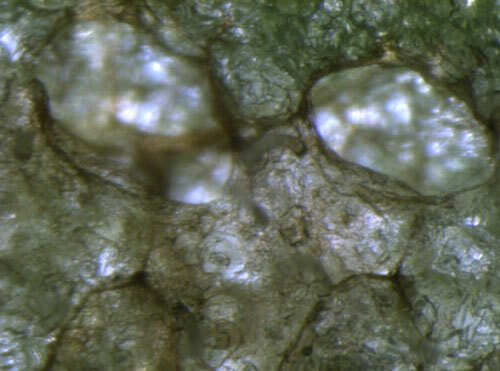 The shells have a more or less elongated honeycomb surface structure. Obviously, the mines the develop have the same number of larvae. 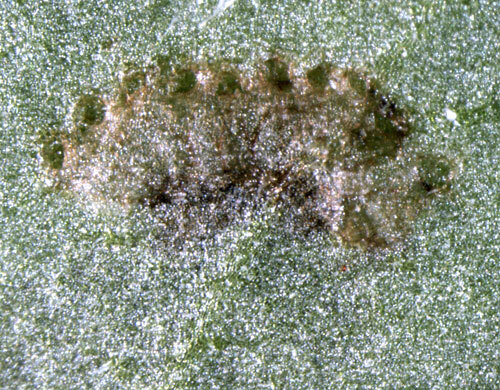 The hatching larvae immediately bore themselves into the leaf, causing a wound reaction in the form of a red discoloration. The mines of the beetle genus Trachys are unmistakable because the female covers the oviposition site, usually the tip of a leaf or lobe, or a sharp tooth, with a drop of secretion that dries and hardens to a shining black blob. Most Lepidoptera don’t have an ovipositor and place their eggs on the epidermis; location, shape, colour, and lustre of the eggs provide important diagnostic characters. 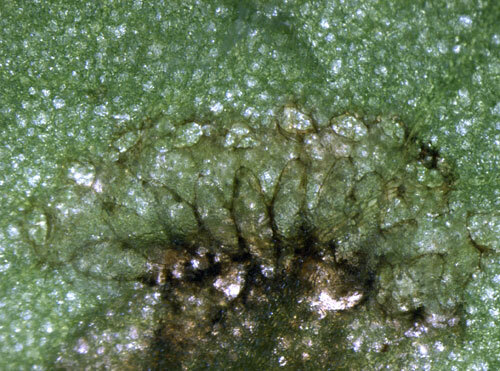 The corridor mines of Stigmella species can sometimes closely resemble those of the common Lyonetia clerkella. They can easily be discriminated because the genus Lyonetia belongs to one of the few Lepidoptera groups with an ovipositor (and thus have ‘invisible’ eggs) while Stigmella, like all members of the family Nepticulidae, have conspicuous, shining, globular eggs. The eggs are also black, because the emerging larvae, at the point of begining its mine, vacates its gut into the empty egg shell. 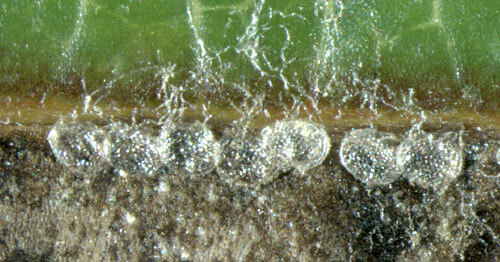 The eggs of Bucculatrix-species are silvery and iridescent. That applies also to the eggs of Leucoptera sinuella, but these are deposited in groups. Oviposition sometimes seems a sloppy process. Here, in a vein axil of a Summer Oak, the shining egg of Ectoedemia albifasciella, and almost on top of it the iridescent egg of Bucculatrix ulmella.